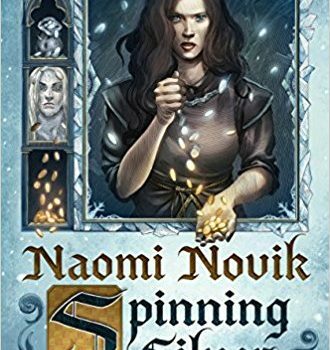 Spinning Silver, Naomi Novik (Del Rey 978-0-399-18098-9, $28.00, 440pp, hc) July 2018. One of the highlights of Navah Wolfe & Dominic Parisien’s The Starlit Wood a couple of years ago was Naomi Novik’s “Spinning Silver”, a shrewd deconstruction of the Rumpelstiltskin tale, which highlighted, among other things, the anti-Semitic undertones of the original, a point which Jane Yo­len and others have previously noted. 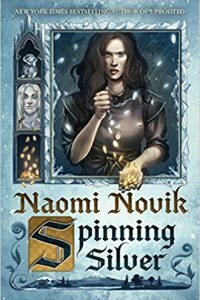 Now Novik has expanded Spinning Silver into an ambitious novel that evokes not only the original fairy tale, but a whole panoply of fantasy spectacles ranging from elemental nature spirits to hints of Disney movies like Frozen or Moana (with one of those lava monsters that have also become ubiquitous in games and films like Wrath of the Titans). 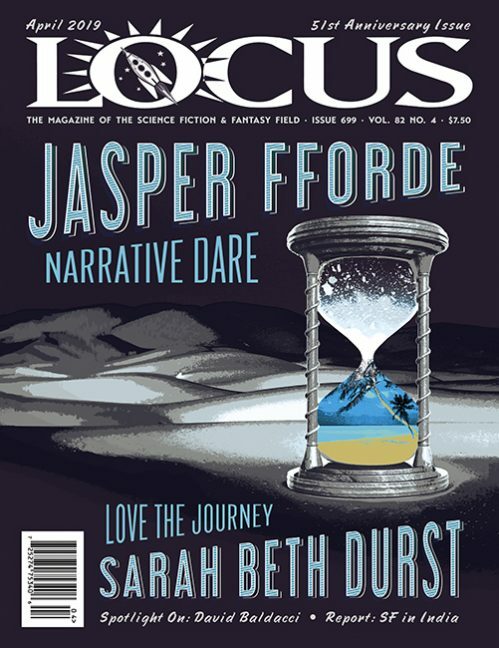 Part of the fascination in reading the novel comes from the skillful manner in which Novik gradually modulates and expands the scope of her tale from its modest beginnings (essentially that original story) into a full-blown epic, without losing sight of the economic and social realities that ground it in human terms. On the one hand, it’s literally a song of ice and fire; on the other, it’s basically the story of two really bad marriages. Spinning Silver begins in a vaguely Eastern Eu­ropean village in which Miryem’s father is the local moneylender, kind but far too softhearted to make much headway collecting payments that are owed to him (though the risk of inflaming the always hazardous anti-Semitism of the locals may play a role as well). When the family sinks into desperate poverty due to the father’s fecklessness, Miryem herself takes over the job of collecting debts, soon supplanting her father and becoming a far more successful entrepreneur. Novik does a convincing job of describing the economics of moneylending in a poor and overtaxed village, as Miryem learns to manipulate the local currency, trading up lesser denominations for greater ones and silver coins for gold ones. The latter practice – a real-world ver­sion of turning silver into gold – enables Miryam’s family to hire the services of a local girl named Wanda and eventually her brothers, all victims of a brutally abusive alcoholic father – but it also draws the attention of the Staryk, elemental elven creatures who live in the forest and thrive in the winter. They begin leaving fairy silver coins at her house, which she trades for gold, and her success is such that the Staryk king promises to make her his queen – whether she wants it or not. This, we learn, is because her purely transactional ability to turn silver to gold becomes an actual magical power in his wintry kingdom. 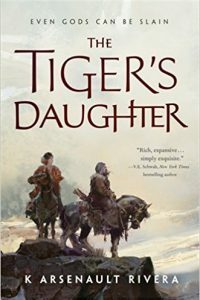 The major new plot line that Novik introduces involves a local duke’s daughter, Irina, the reluc­tant betrothed of an arranged marriage to the tsar Mirnatius, though she realizes he has no interest in her, and “was making a bargain for a girl-shaped lump of clay he meant to use at his convenience.” It turns out that the tsar is possessed by another elemental, a fire-demon, and thus the stage is set for the real epic confrontation between fire and ice. The Staryk has used his power to create an ever­lasting Narnia-like winter in the local region, and the best chance of opposing him may lie with this fire-demon (named Chernobog, after a dark Slavic god who shows up in various video games and in Disney’s Fantasia). But, of course, that entails the risk of Chernobog himself gaining power and turn­ing the world into a desert wasteland. It’s up to the unwilling brides and their allies to somehow forge a balance between these opposing apocalypses. Although both of the supernatural opponents tend to speak in Villainous High Oratory, Novik adds a more human – and more novelistic – texture to the story by presenting additional viewpoints – not only those of the reluctant princesses Miryem and Irina, but of Wanda, the serving girl who eventually takes over Miryem’s debt-collecting, her younger brother Stepon (perhaps the most ap­pealingly innocent of the points of view), Irina’s aging but loyal handmaid Magreta, and, most surprisingly, the tsar Mirnatius himself, who is clearly not happy at being in thrall to a fireplace, despite his arrogant onstage demeanor. Mirnatius may be the least convincing of the points of view, but Novik takes additional pains to reveal that the motives of both major villains are more complex than they at first seem, and succeeds admirably in creating a human-scale cast of vivid characters before the CGI-ready climactic battle that seems a bit too inevitable. Throughout the narrative as well, the real-world themes of faith and anti-Semitism are never far from the surface; Miryem insists on observing the Sabbat even in the ice-palace of the Staryk, and a significant part of the action takes place in the Jewish quarter of the fortress-city of Visnia. When Wanda – whose own education becomes the central part of her narrative arc – ar­rives there, she realizes, “All of a sudden everyone around you was the same as each other but not like you. But then I thought, but it was like that for Miryem already. It was like that for her all the time, in town.” For all the ice- and fireworks that should make Spinning Silver a delight for readers of high fantasy, such insights into the plight of the outsider are what lend the novel both its richness of texture and its deeply felt conscience.